Building a home requires a lot of work from everyone involved - owners, manufacturers and craftsmen alike. As the planning and building of your new home proceeds, each of the parties involved will have many different - and interrelated - responsibilities. The following section is a simplified outline of the basic steps and responsibilities for you, TimberpegⓇ, your local Timberpeg Independent Representative, and your contractor. When you actually plan and build your home, many of these steps will flow together, and you can expect to enjoy much more personal contact with everyone than is indicated here (for example, it may be appropriate for you to work personally with the Timberpeg design department). This outline will, however, give you a good idea of the general sequence of events. Please note, the order of the below steps may vary depending on location, building code requirements and/or your own individual project needs. First you gather all your ideas and meet with your Timberpeg Independent Representative. (To find an Independent Representative near you, click here.) Together, you discuss your budget, needs and hopes for your new home, visit existing Timberpeg homes, and look at floor plans and photos. Your Timberpeg representative will then sketch rough plans if your design is based on an existing Timberpeg plan with minimum changes. If more complicated changes are required, a local design professional (sometimes your Timberpeg Independent Representative) may be enlisted, to provide a higher level of initial customization. Your Timberpeg Independent Representative prepares preliminary construction pricing and a timetable for the completion of your home and you are able to suggest design revisions and any additional modifications. You retain the services of the Timberpeg Design Department by placing a $4,500 design deposit, which will be applied to the price of your home when you sign a Timberpeg contract (for a particularly complex or large home, or a commercial building, the design deposit will be more). The Timberpeg design department creates a home design to meet all your hopes, needs and specifications and you and your Timberpeg Independent Representative work with our Design Department to make any needed refinements. Once you receive and approve home plans, your Timberpeg Independent Representative helps you prepare a Timberpeg Specification Checklist, listing all the building components, contracted services, systems, finishes and appliances you will need for your new home. You or your contractor secure all required building permits and arrange for any necessary financing; if you wish, your Timberpeg Independent Representative will gladly help you. 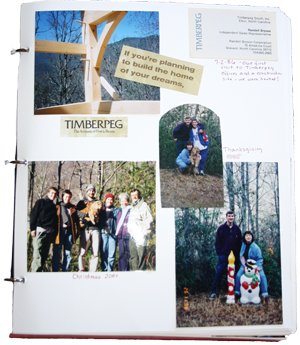 You sign a Timberpeg contract, and remit 10% of the Timberpeg Package Price (the price for all the Timberpeg materials) and Timberpeg assigns a load date and sends a foundation plan and construction details. Your contractor begins site preparation and foundation work; your Timberpeg Independent Representative works with your contractor to coordinate timetables and prepare for delivery of the Timberpeg materials. Timberpeg will prepare the final frame plans for your contractor and 45 days prior to delivery of the Timberpeg Package, you remit 40% of the cost to Timberpeg. Then crafting of your timber frame begins at our production facility. If necessary, a Structural Engineer will review, approve and stamp the plans. Your Timberpeg Independent Representative remains available to you and your contractor throughout (and after) the completion of your home. You move in, and host a big party to show off your beautiful new home! Click here to contact us and get started!